Ken Quigley, an Act! Consultant from Keystroke Quality Computing Inc. recently analyzed and compared the Xact Link for Act! and QuickBooks with QSalesData. Read what he had to say about the products below. QSalesData (QSD) and Xact Link for Act! 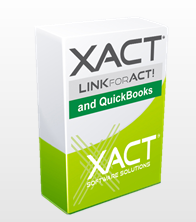 and QuickBooks (XLAQ) are popular links connecting Act! to the desktop accounting product QuickBooks. Commonly this is referred to as workflow or front-office to back-office connectivity and is designed to make data available to sales people or to facilitate process. Desirable outcomes include the elimination of double entry of data, creation of a customer card in QB direct from CRM, providing important financial data to sales people while they call the customer and the ability to create sales documents such as invoices.